The C++ standard library as defined in the C++11 standard provides support for regular expressions in the <regex> header. Prior to C++11, <regex> was part of the TR1 extension to the C++ standard library. 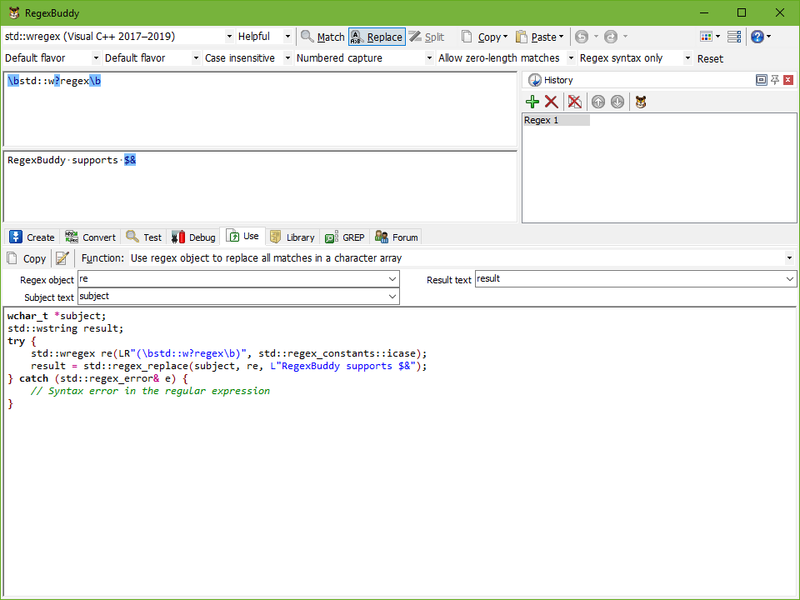 The <regex> header provides various template classes that are very flexible, but not the easiest to use. Fortunately, RegexBuddy knows exactly which template instantiations and which flags you need. 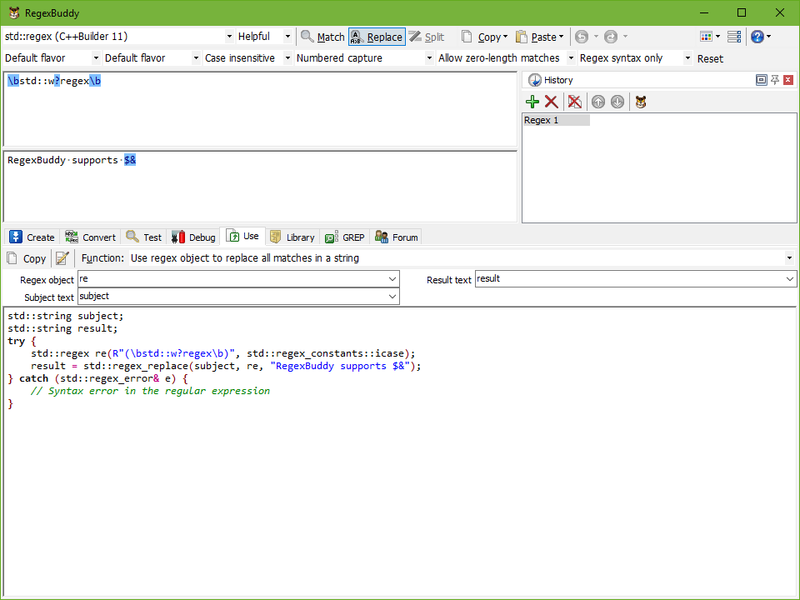 std::regex supports six different regex flavors or grammars. RegexBuddy fully supports all of them. Just tell RegexBuddy which grammar to use to create and test your regular expression. You can convert regexes from one grammar to another. You can even convert regexes that were created for any other regex library or programming language to any of the six std::regex grammars. If you're writing a code library that needs to work with various C++ compilers, compare your regex between the std::regex implementation of those compilers. RegexBuddy knows all the features and all the bugs in the various versions of the Dinkumware library included with Visual Studio 2008 through 2017, C++Builder XE3 through XE8, and C++Builder 10 Seattle through C++Builder 10.2 Tokyo. std::regex behaves differently when processing strings or arrays of char versus wchar_t. With RegexBuddy you can compare and convert between the two variants for all the supported compilers via the separate application choices for std::regex and std::wregex. Don't bother trying to remember all the std::regex and std::wregex template instantiations, their member functions, and the parameters they require. And don't worry about properly escaping backslashes and quotes. Just tell RegexBuddy what you want to do, and you will get the proper C++ code straight away.